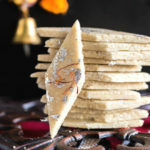 Continuing with my Diwali recipes, today I am sharing with you guys the recipe for one of the most popular Indian sweets, Kaju Katli or Kaju Burfi. 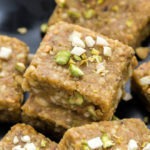 It’s basically a fudge made of cashews (cashew=kaju in Hindi). Me and kaju katli have had a love-hate relationship. As a child, I never liked it. I mean it was my least favorite sweet and everyone I knew just adored it. Basically it used to be that expensive sweet that everyone was crazy about and I never cared enough for it. 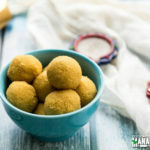 For me simple homemade besan ladoo were million times better than kaju katli. But things have changed now. Our food preferences really change with time, isn’t it? and now I love kaju katli! And I am sure my husband will be really glad to read this. He absolutely loves this sweet and he can’t be more excited that I made it for Diwali. If we talk about the recipe, it appears to very simple with only 3 main ingredients – cashews, water and sugar. However I will not say that it’s super simple to make. Don’t worry I am not trying to scare you guys, of course I want you guys to try it this Diwali but what I want to emphasize is that even if you don’t get it right in the 1st try, don’t give up. 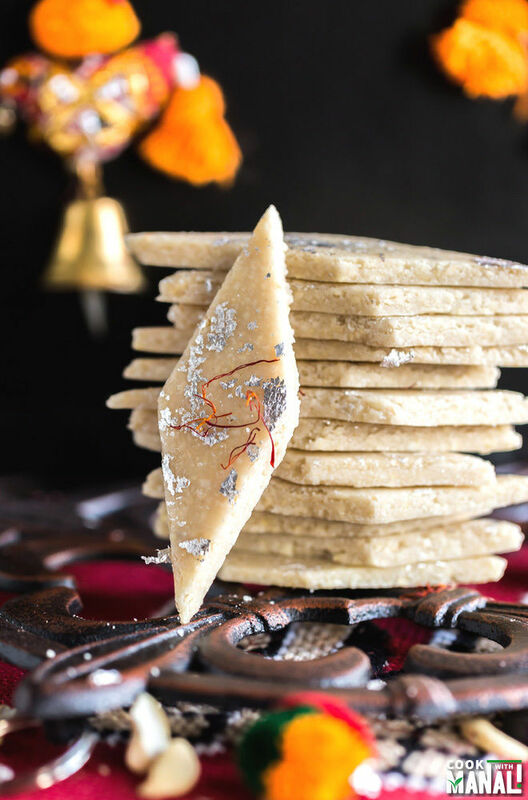 I am confident that with practice you will become and expert making Kaju Katli at home and then you would never want to buy one from the market! 1. Keep cooking the cashew at low heat for 10-12 minutes. It took me around 12 minutes to reach the stage I wanted. You will see that in the pictures below. 2. You have to knead the dough while it’s still warm to make it all smooth. 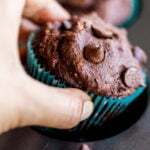 I burnt my finger very badly while doing this, so be careful and wait for few minutes for the dough to cool down a bit. But yes knead while it’s till warm. I added 1-2 teaspoon of milk to make it all smooth as the dough looked little dry to me. The graininess of the cashews goes away completely when you knead it well. 3. You have to roll the cashew dough when it’s still warm. So you first knead it while it’s still warm and then roll it between two parchment papers. It will be difficult to roll it once the dough turns cold. Also rolling between two parchment paper helps so much! It makes the whole process so easy and the katli’s come out wonderfully. Using your food processor, grind the cashews. You have to grind it to a fine powder however remember to not over-grind it. If you over-grind it then cashews will release oil and the mixture will become all sticky and you don’t want that. So few coarse pieces of cashews is okay. Set this aside. To a pan on medium heat, add sugar and water and also rose water drops (if using). Mix and stir till sugar dissolves. Once the sugar dissolves completely, let the syrup boil for 2 minutes. After 2 minutes, add the powdered cashew to the sugar syrup. Mix it well, breaking any clumps with the spatula as you mix. Reduce heat to low. Now keep stirring continuously on low heat. Keep stirring and the below 3 pictures represent the different stages of the mixture with time. It took me around 12 minutes on low heat to reach the stage in the right most picture below. Basically at this point the dough will come together and leave the sides of the pan. It will be quite soft. At this point, transfer the dough to parchment paper. Let it cool down a bit and then apply some ghee on your hands and knead the dough while it’s still warm. You won’t be able to knead it well if the dough cools down so work quickly here. I added 1-2 teaspoons of milk while kneading to make the dough all smooth. This is optional, add milk only if the dough is looking dry to you. Once you have kneaded the dough, the graininess of the dough will go away. While the dough is still warm, roll it with your rolling pin between two sheets of parchment paper. Cut the sides to make a square. Apple edible silver leaves (chandi ka vark) all over the rolled dough and cut into diamond shape using a sharp knife or a pizza cutter. Separate the katils and enjoy! 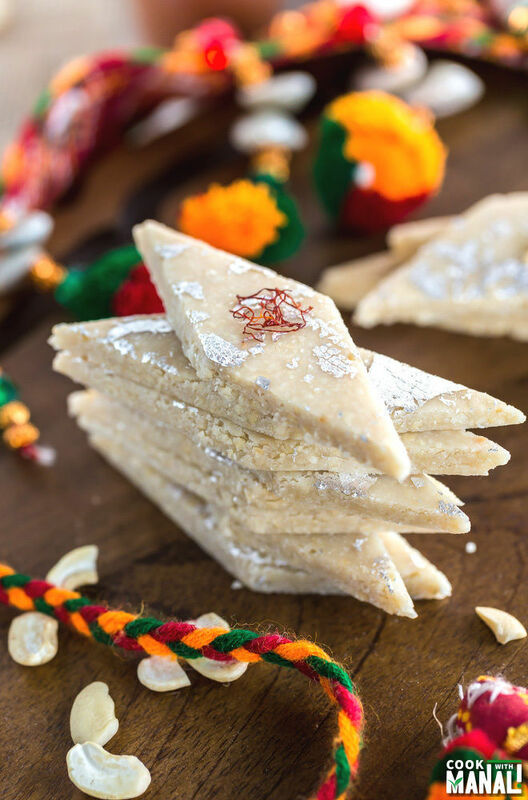 You can store the kaju katli in the refrigerator for up to 10 days! * You can use a plate to roll the dough if you don’t have parchment paper. Just make sure to grease it really well with ghee before you put the dough on it. * Remember it will take some time for the dough to come together. Yes it’s hard work because you have to stir continuously but the end result is worth it. 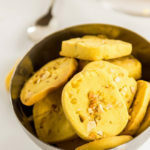 * I kept the katlis/burfi really thin because that’s how they usually are. You can roll the dough thick for thicker kaju katli. 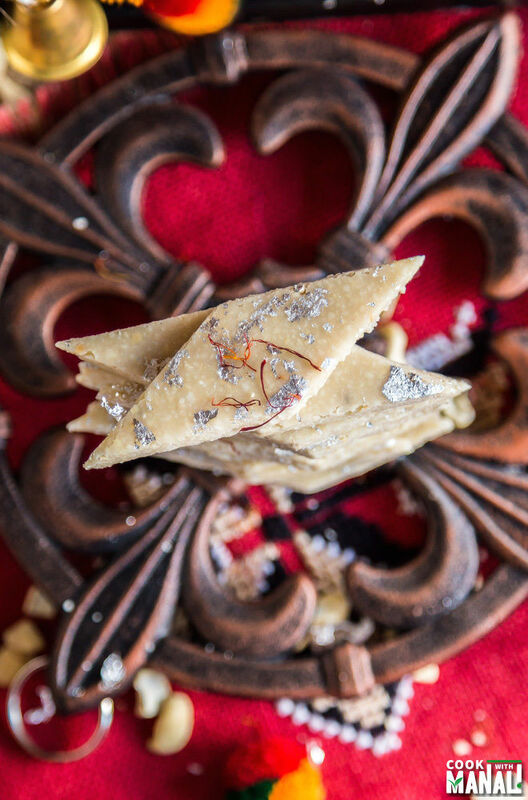 Popular Indian sweet, Kaju Katli is a fudge made out of cashews. 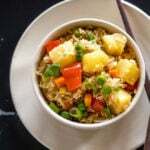 The homemade version is so much better than the store bought! Using your food processor, grind the cashews. You have to grind it to a fine powder however remember to not over-grind it. If you over-grind it then cashews will release oil and the mixture will become all sticky and you don't want that. So few coarse pieces of cashews is okay. Set this aside. Keep stirring till the dough comes together, is thick and leave the sides of the pan. It will be quite soft. This will take around 10-12 minutes [see pictures above]. At this point, transfer the dough to parchment paper. Let it cool down a bit and then apply some ghee on your hands and knead the dough while it's still warm. You won't be able to knead it well if the dough cools down so work quickly here. I added 1-2 teaspoons of milk while kneading to make the dough all smooth. This is optional, add milk only if the dough is looking dry to you. Once you have kneaded the dough, the graininess of the dough will go away. Cut the sides to make a square. 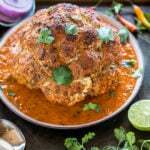 Apply edible silver leaves (chandi ka vark) all over the rolled dough and cut into diamond shape using a sharp knife or a pizza cutter. What a pretty fudge, Manali! I love the presentation of this. Sounds delicious, too! I think I could munch on this all day long! The fact that these are made with cashews has already won me over. I just love them. This is so beautifully presented too. Thank you David, I wish I could send some over! 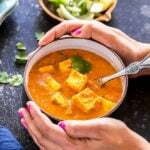 I love your Diwali recipes Manali! These “cookies” look awesome! And I’m a huge fan of these silver edible leaves, I love anything blinky! 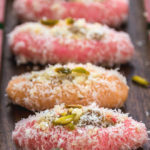 Wow these sweets look delicious Manali! I adore cashews, so I can tell I’m going to love this fudgy treat! I can’t wait to try it! Hahaha, As a child, I just LOVED Kaju Katli, and still it is in one of my favorites. Yours look so beautiful and YUMMY! They are used in almost all Indian sweets 🙂 Thanks Michele! My goodness….how do you keep turning out such fabulous recipes? You must cook all day long every day! I need to move next to you so I can get all your samples! haha that’s pretty much what I do all day! Thanks Kathy! I agree with Kathy! I want to be your neighbor so I can enjoy all of your delicious treats. This fudge sounds wonderful. haha I wish we lived closer, I would have got the opportunity to enjoy your yummy desserts too! That looks like an easy way to make Katli. I can never get the “string” consistency right. Where do you get the edible silver? I got it from India!